A view of Bicentennial Park in Los Angeles, which was cleaned up under an initiative spearheaded by From Lot to Spot, a group created by Viviana Franco. LOS ANGELES, Calif. — Viviana Franco attended high school in an affluent Southern California neighborhood that had tree-lined streets, walking trails and parks. When she went home at the end of the day, she was greeted by a starkly different neighborhood that had liquor stores, broken sidewalks, potholed streets and no green spaces. Franco grew up in Hawthorne, California, a city in Los Angeles County that was transformed by the construction of Interstate 105, an east-west highway that runs between Los Angeles International Airport and the city of Norwalk. The project left a number of vacant lots along the freeway, including one on the corner of 118th and Doty where Franco and her friends would play baseball and tag. The lot was 13,000 square feet and was consistently littered with debris such as old couches, used condoms and syringes, Franco recalled, making it unsuitable for kids to play on. It was Franco's experience with that particular vacant lot to which she credits as the catalyst for a non-profit she established in 2007 called From Lot to Spot (FLTS), which is dedicated to developing green spaces in low-income communities. Since its inception, FLTS has opened and organized four parks, including Bicentennial Park, as well as five community gardens, one bicycle trail and one large urban tree canopy in the greater Los Angeles area. “In these neighborhoods we have so many of these vacant lots that no one takes care of, nobody takes accountability for, so we have no parks,” she said. Franco is among Latino advocates across the United States fighting to increase parks and enhance accessibility to green and open spaces for Hispanic communities, which struggle to access these spaces that are available in many other neighborhoods, according to a 2015 report by Hispanic Federation. In Los Angeles County, where Franco's organization is based, the disparity in park space is significant. According to a 2016 report from the Los Angeles County Department of Public Health, the city of Malibu has 55.5 acres of park space per 1,000 residents, versus 0.7 acres in East Los Angeles. The racial makeup in both areas is also significantly different: in Malibu, about 93 percent of the population is white, while East Los Angeles is approximately 97 percent Latino, according to U.S. Census estimates. “The same reason that high-income communities want to have nice parks in their neighborhood, they’re the same reasons we do,” said Laura Esquivel, director of national advocacy at Hispanic Federation. While lower-income Latino neighborhoods often lack access to green spaces, they also suffer from higher rates of chronic health conditions such as obesity, diabetes, and cardiovascular disease. Among prevention measures for these include increased physical activity. According to the Centers for Disease Control, creating or improving access to places for physical activity suggests a 25 percent increase in the proportion of the population who are physically active at least three times a week. A related key benefit of parks is their impact on air quality and climate change, an issue of concern that ranks high among Hispanics. According to a 2015 Latino Decisions poll, 85 percent of respondents said reducing smog and air pollution was extremely or very important, while 82 percent said they were very or somewhat worried about global warming and climate change. Trees and vegetation in parks and green spaces help mitigate climate change by eliminating and storing greenhouse gases – such as carbon dioxide; they can also remove air pollutants, according to a report from the National Recreation and Park Association. Along with health and environmental benefits, parks provide a place that facilitates improved social cohesion. In recent years, some communities that were previously barren of effective green spaces have witnessed a metamorphosis in their neighborhoods after advocates successfully fought to improve and establish parks. One of these is in the Iron Triangle neighborhood of Richmond, a city in Northern California that saw stronger social ties and better safety after the 2014 transformation of a 0.5-acre pocket park called Elm Playlot. In the neighborhood – which is named for its triangular boundary established by three railroad tracks – blacks and Latinos constitute the largest segment of the population. Luciano del Rio, 30, is a community activist who grew up in Richmond, which has had a long history of violent crime. Prior to what Elm Playlot has become today, the area used to be one that parents wouldn't feel comfortable sending their kids to go play in, he said. Today, local residents recognize it as a bubble of safety, said Toody Maher, executive director and founder of Pogo Park, a non-profit that maintains Elm Playlot and spearheaded its renovation. “Everyone knows if you're going do bad things, do not do it in or around the parks,” she said. The park has become an important part of the neighborhood and has provided a space for area residents to meet and socialize with one another, Maher said. It also hosts a variety of programming including zumba classes, a chess club, a mobile petting zoo, and free vision screenings for children. “Now families want to move in the area because there's a park that they can come in and is within their vicinity,” del Rio said. A few hundred miles south, back in Southern California in a neighborhood near East Los Angeles, long-time resident Pam Marquez, 67, said she noticed a similar result during and after the El Sereno Arroyo Playground opened its doors to the public in 2012. Marquez said that while the park was being built, she saw two houses bought and flipped in the span of a few months. She added that she has also seen an increase in property values in her neighborhood. While the positive outcomes of parks on individuals and the environment has been documented, bringing them into low-income communities is often a long and arduous battle. In Marquez's neighborhood, completing El Sereno Arroyo Playground was a seven-year process. And it was her husband,Val, 67, who launched the park project after being inspired by his own experience of having had access to an open space while growing up. “I had a place to go, and a lot of times these kids didn’t have a place to go,” he said. 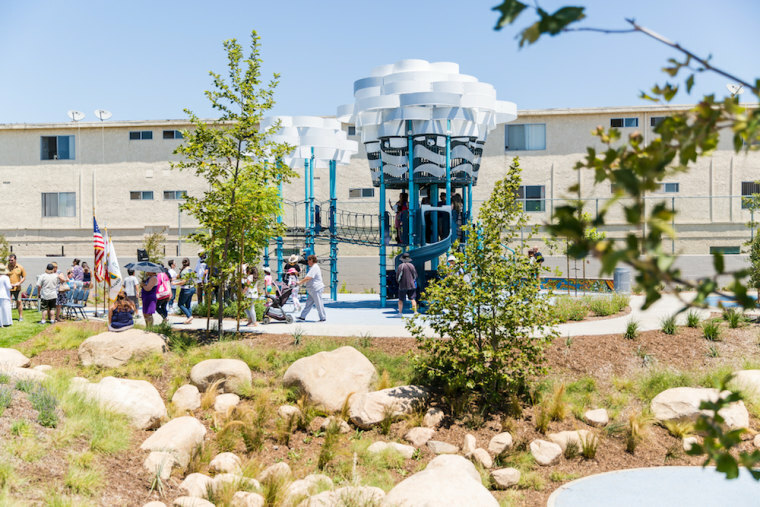 The park's “first phase,” according to Val, began in 2008 with the planting of 52 trees, a part of the development that involved the Los Angeles City Council and the local neighborhood council. Val further lobbied public officials and held at least half a dozen community meetings to gauge what amenities residents wanted in the space. He also participated in the negotiation of a 25-year lease for the government property on which the park sits with the help of L.A. City Councilman Jose Huizar and then-California legislator Gil Cedillo. The establishment of El Sereno Arroyo Playground in Los Angeles was spearheaded by a local resident, Val Marquez, 67, who was inspired to do so by his own experience of having an open space to use while he was growing up. Courtesy: Val Marquez. In addition to bureaucratic processes, establishing the park came with financial hurdles. The caveat with using government-owned property, Marquez said, is that it could be taken back if needed. Because of that possibility, the park could not receive taxpayer dollars, she added. Despite the initial funding setbacks, however, a breakthrough came when one company decided to donate $35,000 if the park could be built within four months. In the end, the project received $1.2 million from private donors, as well a donated playground and partial funding of the park's fence, he added. For Franco, the Hawthorne native who established From Lot to Spot, it also took seven years before she and her community successfully converted an empty lot on the corner of 118th and Doty into a park. In 2005, Franco began going door-to-door around her neighborhood to get residents to sign a petition for a park. It was then presented to the city, but ultimately wasn't supported. The particular lot she and her friends played in when they were younger was eventually used to build housing units. Years later, Franco worked with the City of Hawthorne to create a pocket park in 2012 with the same address on the other side of Interstate 105. Over the last decade, Franco's organization has built 11 green spaces. Its goal is to establish a total of 20 by 2020. Franco said that in communities scattered with vacant lots, FLTS has documented activities like prostitution, illegal drug use and illegal dumping. “They become beacons for that and it’s unfortunate, because in neighborhoods where children have nowhere else to play, they're surrounded by that negative activity,” she said. When these spaces are turned into parks, things change for the better.